History didn’t end in 1989, after all! The deep, global, dense, systemic crisis of capitalism proves it. The crisis has shown that its exploitative, oppressing, aggressive, predatory nature did not derive from its competition with the USSR and the socialist world. Those features are inherent to the system itself. It is not by chance that the crisis is located at the center of the capitalist system. The root causes of the problems faced by workers and peoples are inherent to the system, they exist within the system. And the responsibility of social-democrats, conservatives and other right-wing forces comes from their unswerving support to the capitalist system. With a roar, the crisis drags into its turbulent stream staggering economic failures – the case of the euro – dramatic bankruptcies, speculative bubbles. The system is bloated with liquidity and toxic waste and is bursting at the seams. It is dragging down countries and whole regions, it reveals tax heavens that are peoples’ hell but are heaven and laundries for big business, arms traffickers, drug dealers and organ smugglers. It produces stagnation and recession. The social consequences are tragic. The political consequences are no less momentous. Capitalism’s main construct in Europe, the European Union, is taking on water every where we look. And war – which has always been a solution for capitalism’ and imperialism’s crises – is ever present, devouring “lives and assets”. The scale of the crisis is reflected in the forceful return of old recipes to address diminishing rates of profit: cutting wages and extending working hours through political pressure and the deregulation and liberalization of the labor market. The eruption of financialisation, which diverts significant amounts of money from productive investments, thus restraining the classical solution – to increase capital’s technical component – in order to curb the decline in the rates of profit. The formation of surplus value faces a deep crisis. And significant amounts of capital become fictitious capital and financial toxic waste. The financial sector that in 2007 caused the outbreak of the crisis dumps the trillions of euros and dollars of its private debts on to states, adding new problems to older ones, weakening them financially and structurally and forcing savage budgetary cuts. The dominant ideology, that of capital, has to keep telling us that everything is fine, with a few minor glitches … that will be corrected. It is a denial of the crisis. We will continue to hear, emphatically, that there is no alternative. They will proclaim that outside capitalism there is no salvation. There are two red lines in this: the refusal to see capitalism as the root cause of peoples’ current problems; and the concealment and silencing of the fact that the crisis has put into question the “theoretical” foundations of capitalism and its advocates and propagandists. I recall that after the fall of the USSR, they had decreed that capitalism was the final stage in the development of mankind, “the end of history”… and hence that there was no alternative to capitalism. It is important to shed some light into the murky explanations provided by the right and by social-democrats. Even though they cannot provide any solutions whatsoever. Because they conceal the capitalist roots of the crisis, they encourage ideological and political confusion while attempting to prevent the masses from organizing and diverting them from the struggle. “Scapegoats” are invented to explain what could not have failed – the “operation” of the capitalist system. Ethical explanations are sought, a “crisis of civic and moral values” is invoked. The crisis of the “elites” is the often repeated explanation for the crisis in the European Union, which has leaders who are not up to the (myth) of the “founding fathers”. Likewise, the greed of managers and shareholders is alluded to. And the answer is Corporate Social Responsibility. Against greed, the ethical company and the manager with a social conscience. This is where food banks come in, and their financial version, the microcredit institutions, the “humanitarian” NGOs and the exploitation of “voluntary work”. Capitalism cannot survive without continuously revolutionizing the productive forces. New technologies are portrayed as evidence of the system’s success. And they come in handy to justify unemployment: it is not capital that causes unemployment, it’s the new technologies. Now, Capitalism 4.0 has arrived: robotics, the “merging of digital technologies and the internet with conventional industries.” The publicized 4th Industrial Revolution proclaims that jobs will disappear, replaced by machines that will be “intelligent.” Capitalism wants to accomplish an old dream: profits without workers. What the new technological revolution foreshadows is, in fact, the obsolescence of labor submitted to the social relation of oppression and exploitation that characterizes capitalism. How is the crisis of capitalism in Portugal portrayed in political discourse? Its various versions have always at their core the justification, defense and exculpation of 40 years of restoration of capitalism, big landowners and imperialism. One version insists on the “nationalization” of the crisis, depicting it as an exclusively “internal” problem of the country. Sometimes, the crisis is even described as being the responsibility of the people because they elected those who caused the misfortunes. As if the process of European capitalist integration, with its single market and the euro did not exist. As if capitalist globalization was not in full swing, with the free circulation on capital and free trade agreements. Another version of the political discourse criticizes “ideology” (from the left) for meddling in political decisions without being called upon and without taking into consideration “economic reality/rationality.” It is a discourse where “reality”, a second nature, is governed by the economic “science” of Cavaco Silva and Teodora Cardoso. The most interesting versions are the discourses that theorize the idiosyncratic nature of Portuguese capitalism. Emphasizing, in particular, that it is a “capital-less capitalism” and the “poor quality of Portuguese capitalists”. The problem is therefore not capitalism itself but its Portuguese variety! Henceforth, passionate appeals are made to foreign capital and capitalists. Capitalism is in the throes of a deepening crisis! The theoreticians of capitalism, its ideologues, politicians, the financial oligarchy all worry about the crisis. Weren’t things supposed to have been settled once and for all after the fall of the wall? “An obscure uneasiness, the confused realization that the system may be at stake, even threatened”, clouds their minds. But “democracy” does not work as they would like it to. There are surprising outcomes and strange characters are elected. Referenda do not go the way oligarchs had wished. Peoples are ungrateful, if not plainly ignorant; and there is the rise of populisms, radicalisms and extremisms. That is why anticommunism resurfaces, as always fetid, gross and deceitful. That is why so many mercenaries and scribes attempt to re-write history. That is why we live in times of many words, many images, many facts about actuality to better conceal reality. These are the times of post-truth, post-politics, beyond ideologies. Of gibberish and muddled discourses about the similarities between extremes or the virtuous “middle ground,” to conceal the political responsibilities of that “middle ground,” to disallow political alternatives outside capitalism! This is a system that is imploding, brimming with new and old contradictions. Because the dominant oligarchies are unable and powerless to address them, other than with more exploitation and oppression. The ripening of the objective conditions for the revolutionary overcoming of capitalism has been confirmed. But capitalism will not die a natural death, regardless of the many crises and wars that it may still bring forth. Nothing has been decided yet. It is the struggles of the masses, the struggles of peoples that will ultimately decide its fate. That is our battle, to develop the organization and to carry on with the struggle – without surrendering to capitalism. • The struggle for socialism, the only real alternative. • Our confidence in the theoretical and practical soundness of the ideas developed by the builders of the workers’ and socialist movement. •In the social and civilizational advancements made possible by the October Revolution. Notwithstanding considerable defeats, mankind has moved forward. 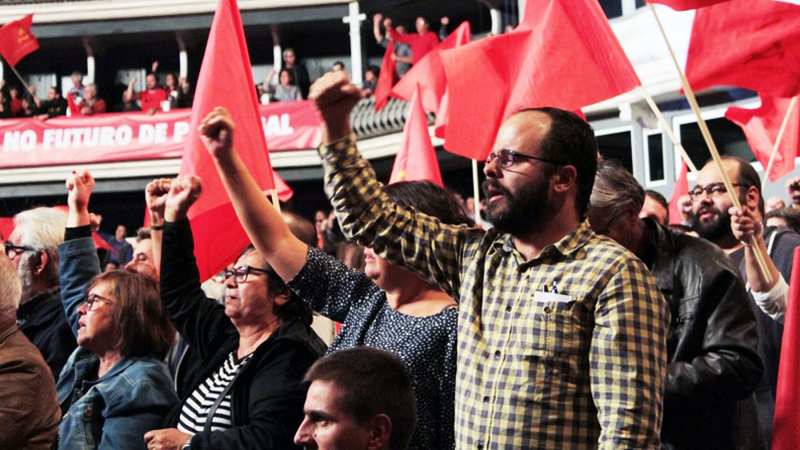 • Our confidence in PCP’s long history of struggle for its people, for Portugal. This is the Party that we were, that we are and will continue to be, the time and the place where we find the roots of our strength and our resolve to bring about transformations and the revolution. Editor’s Note: The contribution above was delivered at the 20th Congress of the Communist Party of Portugal.